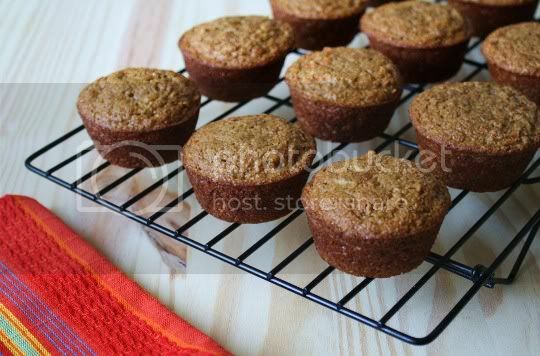 If you like bran muffins, then you'll like this light and fruity take on them. And even better, they're healthy! Each muffin contains about 110 calories, one gram of fat, two grams of fiber, and three grams of protein; they also live up to their name, so one is hearty enough to keep you satisfied! They're pretty easy to make (aside from the apple and carrot shredding), but the batter is, well, interesting. Mainly, there's a LOT of liquid in it, including fat-free milk (super thin), maple syrup, egg whites, and oil. 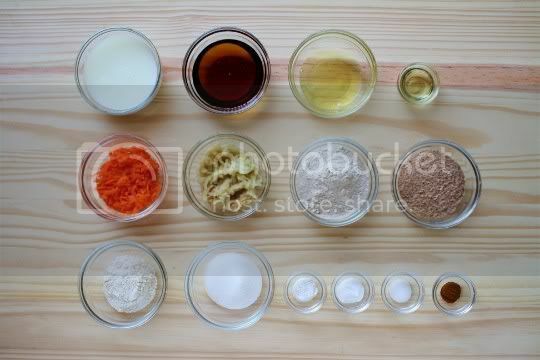 The combined amount of liquids to the seemingly small amount of dry goods is definitely noticeable: the finished batter is almost soupy. There is both baking soda and powder in it, but the end products won't really rise like you'd want them to. I'd suggest a few options: squeeze out the moisture from the apple after grating it; decrease the milk by a couple tablepsoons; or increase the flour a couple tablespoons. Aside from all that, the finished muffins are still super tasty. They're very sweet; sugar, the apple, and maple syrup might take you on a slight sugar overload. But there's also a heartiness to them from the whole wheat flour, and there's a nice crunchiness from the wheat bran. 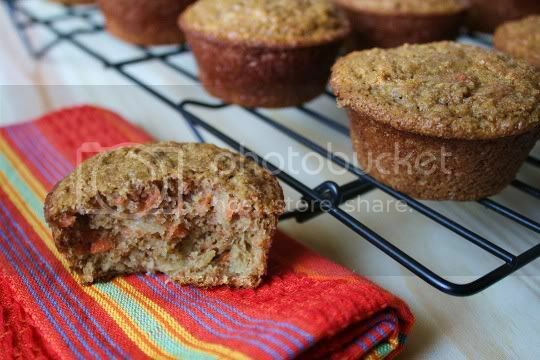 I didn't really taste any distinct apple or carrot flavors, as the muffins just have an obvious sweet and tangy fruitiness to them. 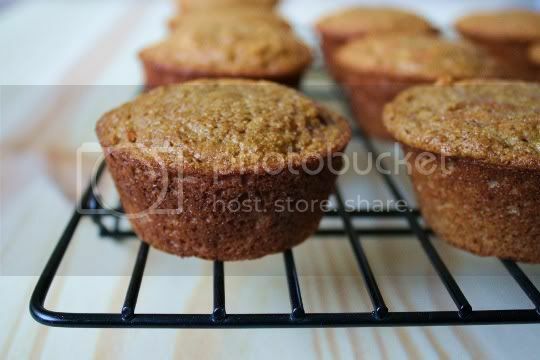 The texture of the muffins (ah, the soupy batter results) is extremely moist, almost too moist. While they were definitely soft and fluffy, it was almost in a wet way. Strange. They did, however, freeze well and were still soft, fluffy, and moist once thawed to room temperature. Make again? Probably not. I like the concept of the healthy bran muffin, but something about this recipe's measurements just seems off. Vegan variation: Use a non-dairy milk and egg replacer. This looks Yummie! My husband will love these! Thank you!